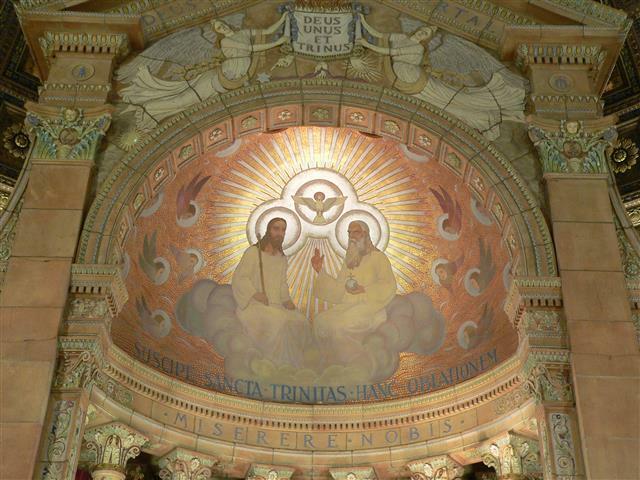 Sunday, June 15, is Trinity Sunday, our parish feast day. 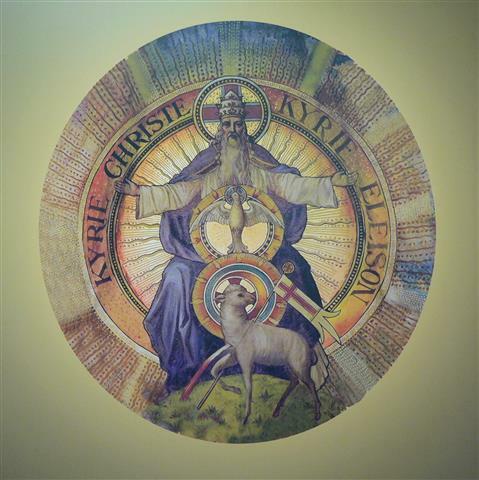 This symbol of the Trinity appears in our church’s Great Dome. Photo credit: Todd Treat. Tuesday, June 17 at 7:30 p.m. ~ Choir Rehearsal in St. Charles Hall. Wednesday, June 18 at 7:00 p.m. ~ Parish Council Meeting in 2nd floor Bingo Hall, St. Charles Hall. Thursday, June 19 at 8:00 p.m. ~ Bingo will be played in St. Charles Hall. Saturday, June 21 from 10:30 a.m. to 12 Noon ~ Helping Hands Food Pantry in St. Charles Hall. Saturday, June 21 at 8:00 p.m. ~ Bingo will be played in St. Charles Hall. Monday, June 16 ~ Communion Service at 11 a.m.
Sunday, June 22 ~ Baptism of Erik Robert Brodfuehrer at 1:30 p.m.
Depiction of the Blessed Trinity in our church’s baldachino. The Parish Council will meet this Wednesday, June 18, at 7:00 p.m. in the second floor Bingo Hall of St. Charles Hall. Ladies Sodality Dinner ~ The Ladies Sodality will usher in their summer break with a June 25, 2014 dinner in St. Charles Hall, catered by parishioner David Folmar. Following the dinner, guests will enjoy a presentation by Dr. Bonnie Flickinger entitled “Flowers and Plants of the Bible” (more below) and we will be presenting Fr. Reger with a monetary gift for the parish. The evening’s menu will feature herbed marinated beef tenderloin, lemon-thyme chicken, oven roasted red jacket potatoes, grilled vegetable salad, mixed greens salad, coffee, tea and dessert. The dinner is open to all women of the parish, and guests are welcome. The events begins at 6:30 p.m. The cost is $15 per person, with checks payable to: Ladies Sodality of Blessed Trinity. Reservations are required no later than Sunday, June 22. Click HERE to make yours. Pre-payments are being accepted by Patty Gallisdorfer, Marianne Pernick, and Vera Andrew. Flowers and Plants of the Bible ~ All are invited to Flowers and Plants of the Bible ~ Their Meaning and Their Symbolism. This slide lecture, presented by Dr. B.G. Flickinger, will take place on Wednesday, June 25 at 7:30 p.m. (following the Ladies Sodality Dinner) in St. Charles Hall. Stop by after the Sodality dinner and enjoy some fascinating information on flowers. Dr. Flickinger has four university degrees and is a journalist who has been on the lecture circuit for 20 years. The Sodality welcomes your presence for this intriguing discussion. For more information contact Marianne Pernick by clicking HERE. A Giant “THANK YOU! !” to all the wonderful volunteers who helped with so many events over the past month: the Sacred Sites Open House in May, the Colored Musicians Club concert on June 1, the Path through History Weekend on June 7, and our end-of-Easter season de-decorating this past week. It’s been a very busy time, and we couldn’t have done it without you! You’re a great group – God bless you all!! Our Parish Congratulates former Pastoral Associate, Sister Flavia Dampf, on the Seventieth Anniversary of her profession of vows as a Sister of Social Service. If you would like to send her a personal note of congratulations, you may address it to Sr. Flavia Dampf, Sisters of St. Joseph Residence, 4975 Strickler Road, Clarence, New York 14031. Honoring our Daughters of Charity, Sister Ann Paul Chenard and Sister Claire Edwards ~ We join the Diocese in honoring the Legacy of the Daughters of Charity in Buffalo, celebrated at a June 8 Mass at St. Louis Church and a brunch reception at the Hyatt Regency Buffalo. “In 1848, eight Sisters of Charity arrived in Buffalo to serve in education, social ministry and healthcare, establishing the city’s first hospital — Sisters of Charity Hospital — on Pearl Place. Over the next 165 years, the Sisters became the Daughters of Charity, growing their healthcare ministry on Main Street in Buffalo and helping to establish the Catholic Health System in 1998. This summer, the Daughters will leave Sisters Hospital to serve in other areas where there is great need and fewer resources, entrusting their rich legacy to the doctors, nurses, and support staff, who will carry on their healing work.” Among the Daughters being honored are parishioners Sr. Ann Paul Chenard and Sr. Claire Edwards. Sr. Claire presently serves on our Parish Council, is a member of the choir, and the treasurer of our Ladies Sodality. To read more about Buffalo’s Daughters of Charity, click HERE. Collection for the Catholic Communication Campaign ~ Thank you for your generosity in last week’s Collection for the Catholic Communication Campaign. Because of your support, millions of faithful will have the opportunity to deepen their faith through resources on the Internet, television, radio, and print media. Remember, half of your donations are staying in our diocese to support our communication needs. To learn more about the important work supported by the Collection for CCC, please visit www.usccb.org (Search “Catholic Communication Campaign”). Bingo Volunteers Needed ~ Bingo is the largest source of parish operating funds and an important form of stewardship. Please consider a gift of time to your parish family. Fran Cahill will be happy to assist you in joining the team. You can leave your name and contact information for Fran by clicking HERE, or call the parish office (833-0301) and Fran will contact you. Summer Opportunities for Children ~ As we receive information about camps and programs for children, we will display it on the table in the front vestibule of church. Catholic Charities at Work ~ Millions of refugees are displaced around the world. Catholic Charities has a tradition of resettling refugees who have been displaced from their countries of birth, fleeing from regimes of insurgents that seek to torture, imprison or kill them. Our Diocese offers a safe haven through the Catholic Charities Immigration and Refugee Assistance Program. Here they find shelter, food, clothing and support. For more information on how you might help welcome the transition, call 716-842-0270 and ask for the volunteer coordinator. 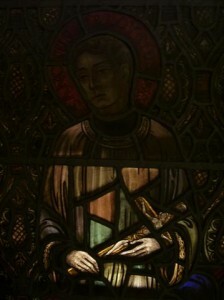 An artist’s impression of St. Aloysius Gonzaga appears in stained glass in the Shrine Area in the church’s right (west) transept. He is one of four saints depicted in the two Shrine Areas, each representing a period of life. St. Aloysius who lived from 1568-1591 is the young adult saint and patron of youthful chastity. (Rev. Walter Kern’s Guidebook to Blessed Trinity R.C. Church, page 27). Chicken BBQ ~ Blessed Sacrament Church will hold a chicken BBQ by BW Barbecue on Sunday, June 22, from 12:00 – 3:00 p.m. at Catholic Academy of West Buffalo Gym, 1069 Delaware Avenue, Buffalo. All dinners include: garden salad, 2 sides, beverages, and dessert. Adult ½ chicken dinners are $10, child ¼ chicken dinners are $5. Bereavement Camp for Children ~ Niagara Hospice will present its 14th Weekend Bereavement Camp for children June 27-30. Camp Hope is held at Camp Kenan in Barker and is FREE to children age 7-13 throughout Western New York – whether or not their family ever received hospice services. For one weekend, children who are grieving the loss of a loved one will have the opportunity to share and work through their grief with other children and trained professionals. Call (716) 280-0777 for more information and a camper application. Applications and more information can also be found online at www.NiagaraHospice.org. Call for Artists and Crafters ~ The Parish Community of St. Aloysius Gonzaga invites crafters and artists to participate in our Summerfest Extravaganza on Sunday, June 29 from noon to 6 p.m. This is a well established event and serves well over 500 BW BBQ dinners. We also have hot dogs, sausage and beverages for sale, Basket Raffle, Car Show and much more. For more information call St. Aloysius Rectory at 833-1715 or Colleen at 834-1517. Seeking Cooks & Registered Nurses for Camp Turner ~ Call John at 716-354-4555. Download application from http://www.CampTurner.com.